All celebrity weddings make a statement and most say "hey I'm incredibly rich and this is what I dreamed up for my wedding". Then there are the extremely memorable weddings that us mere mortals will remember forever. For me, one such wedding is that of Gwen Stefani & Gavin Rossdale. And let's be honest, if you remember this wedding then you most likely are remembering that dress. That breathtaking and quite daring Christian Dior gown that singlehandedly made color in wedding dresses chic AND brought major attention to the 'ombre' trend in fashion. 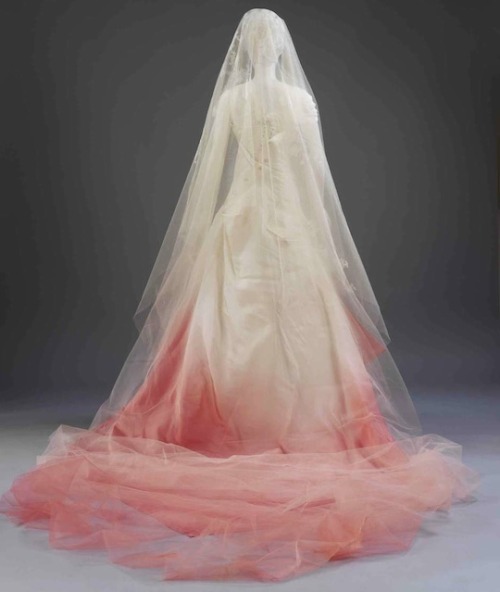 It is so iconic that in March 2011 that gown found a new home at the Victoria and Albert Design Museum in London. Now back to wedding details. "After six years together, Gwen Stefani and Gavin Rossdale were more than ready to get married – even if the bride was an hour late to the ceremony. The couple exchanged vows on September 14, 2002 during a traditional Anglican service at St. Paul’s Covent Garden in London. Stefani carried a delicate bouquet of phalaenopsis orchids and her grandmother’s Catholic prayer book down the aisle. A second wedding was held in Los Angeles two weeks later. According to Stefani, it was held so that she could wear a custom-designed wedding dress by British-Gibraltarian fashion designer John Galliano twice. The fashion-forward singer, who has since also become a best selling designer, wore a bright lipstick that echoed the hot-pink hue detailing the bottom of her hand-painted gown (Source)." "The groom wore a traditional British morning suit and was escorted by his Hungarian sheepdog, Winston, who donned a garland of red flowers. Following the vows, guests boarded double-decker buses and headed to Home House, a private club, where a six-course Italian dinner was served in the courtyard garden. The menu included risotto, pasta and seafood. To celebrate their first anniversary, Rossdale and Stefani returned to St. Paul’s Covent Garden with the same car and driver they had on their wedding day (Source)." Now for the photos! If you want to have a dash of pink in your wedding dress, thanks to trendsetter Gwen there are many options to fit your style. I love this one, which was a collaboration between the bride & the designer. Just one example out of hundreds. Explore & enjoy!